Debbie is well known in the community as a passionate and spirited photographer. Her focus is on sports, photo booths, events, portrait and real estate photography. Debbie Bradley Photography is based out of Huntsville & Lake of Bays in Muskoka and is the official photographer for the Muskoka Hornets Baseball League. Debbie is affiliated with Cavalcade Color Lab in Huntsville where she's an instructor of photography and digital camera courses. As an experienced natural life photographer including wildlife and landscapes, Debbie has taught photography workshops in Algonquin Provincial Park in association with Friends of Algonquin and with the Haliburton School of the Arts. As a freelance photographer, you will frequently see Debbie's work published in print and online media. A member of Huntsville Art Society, Debbie's fine art has been featured in the Partner's Hall Gallery at Algonquin Theatre, with Sisters Showcase: An eclectic collection of creative photographic images. 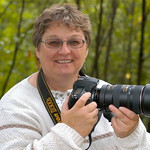 Debbie lives on the edge of Algonquin Park in Dwight, Ontario and enjoys the opportunity to capture nature and wildlife images everyday on her doorstep.